Favorite Places – an artful experience from Museumsquartier to Favoriten. Between July and September, Stand 129 held a number of workshops within and outside of mumok – Museum für Moderne Kunst Stiftung Ludwig Wien for young adults from Spacelab in Vienna’s 10th district Favoriten. 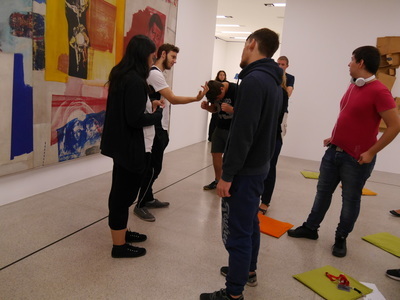 During the kick-of event in July, the group visited the exhibition “Ludwig Goes Pop” with an art mediator at mumok. 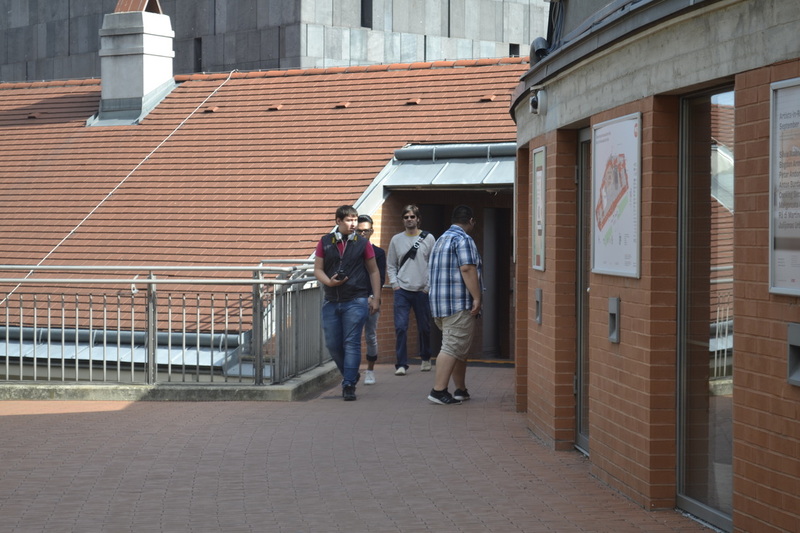 During this session, they experienced the museum as a space and also reflected on how the architecture resonates with everyone. 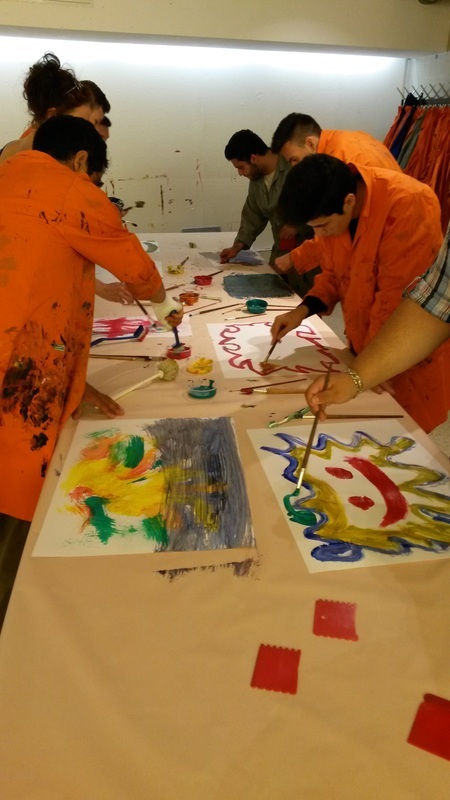 To get the full experience, the youths had the chance to paint in mumok Atelier to different styles of music and with different tools such as sponges, scrapers, brushes and scrubbers. It was wonderful to see how these factors change the rhythm of working and the youths created expressive artworks within the museum. A group discussion about topics of “Pop Art” and how artists worked with every day subjects at that time stood at the beginning of an exploration of the museum from part of the youths. The most interesting work for the youngsters in the exhibition was the work called “Mouse Museum” by Claes Oldenburg which consists of many different kinds of daily objects from 1960-1977, exposed in a Mickey Mouse -shaped mini museum that took most of the space in the 4th floor of the exhibition. In the next session, the participants were invited to choose an object which has an important meaning for them. Each participant put his/her object on the table and together, without knowing which object belongs to whom or why they had chosen it, the group thought and talked about the meaning of the objects on table. They all curated a small exhibition with these objects together. At the end everyone told the story of the object he/she had chosen and together they curated the exhibition one more time. 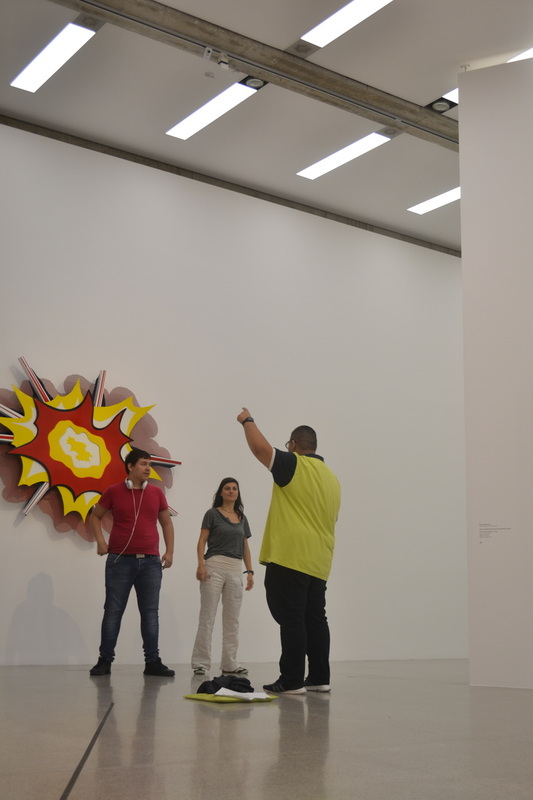 The differences between the two exhibitions, as well as the question of how objects can have a meaning and symbolize a history were topics of the reflection of this exercise. 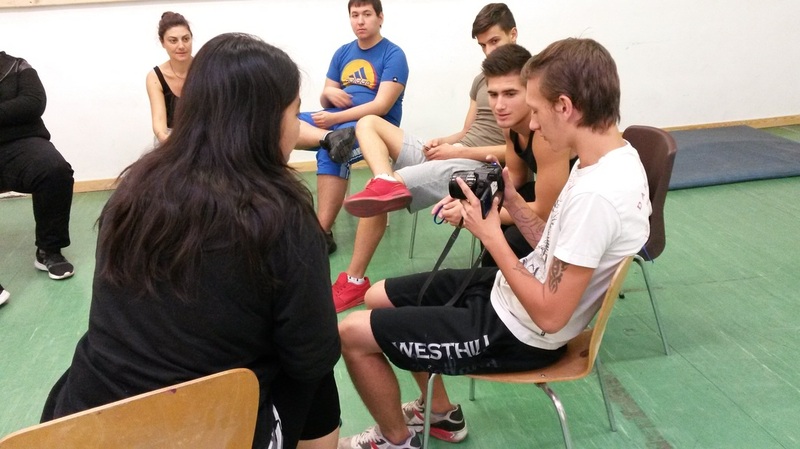 The youth were also introduced to techniques of theatre improvisation to let them experiment with their ways of expression and body language. Furthermore the youngsters were invited to get familiar with video equipment by fun games and exercises. After each task, the filmed material was played back to see what the youths liked and didn’t like about the material and to encourage discussion about how it feels to be exposed on the one hand and how it feels to direct a camera on the other hand. 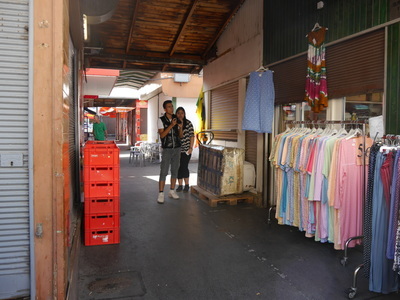 As a next step, the youth went out to film certain adjectives and also feelings they were given. When watching the material, the other groups had to guess what they had just seen. How is it possible to visualize such abstract feelings? What associations do we have? Which representations are easy and which are hard to decipher? One day was entirely dedicated to the question of representation and self-representation. 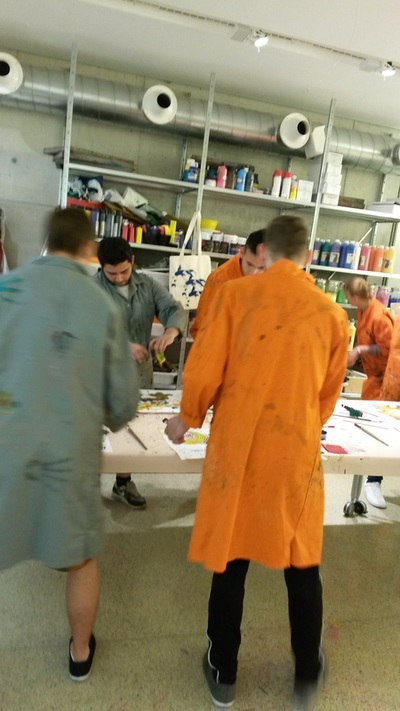 Some of the participants had prepared huge stencils of their idols. Those were painted on big canvases and the group talked about why they had chosen these persons, what they liked or didn’t like about them etc. 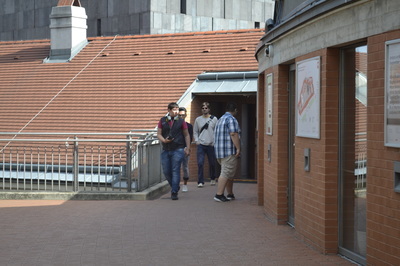 Later, the youths brought one of the graffities with them to “expose” it in the public spaces of Museumquartier. 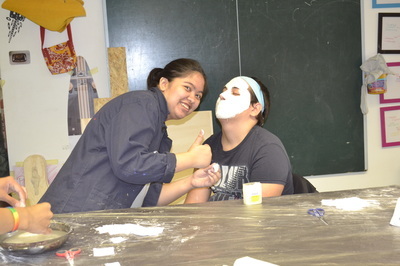 Parallel to the graffiti painting, a mask making workshop was held. In pairs the participants made a plaster cast of their faces. During this process reflection was encouraged upon questions such as how it felt to be underneath the mask and if one recognizes the persons that were the “models” after the mask was finished. Also, they transformed some of the masks and gave them special features. The group talked about how masks can show and hide identities at the same time. 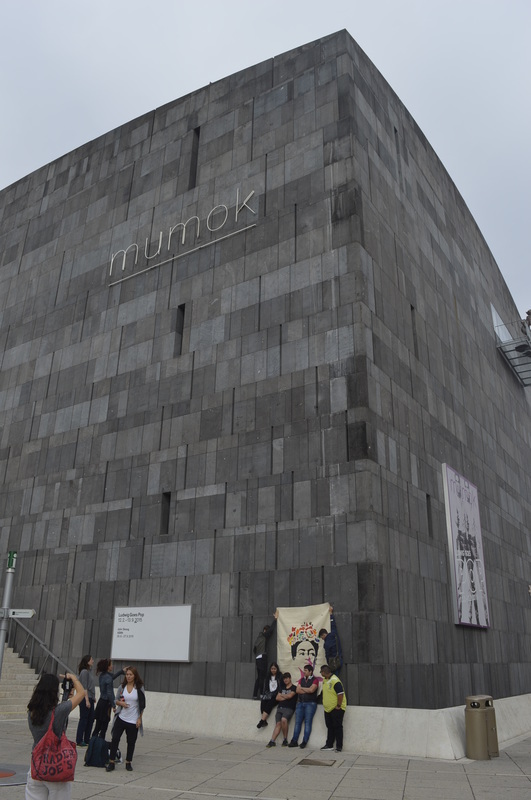 Another day at mumok was all about the subject of art and body. After a little worm up, the youths interacted actively with the artworks in the museums. 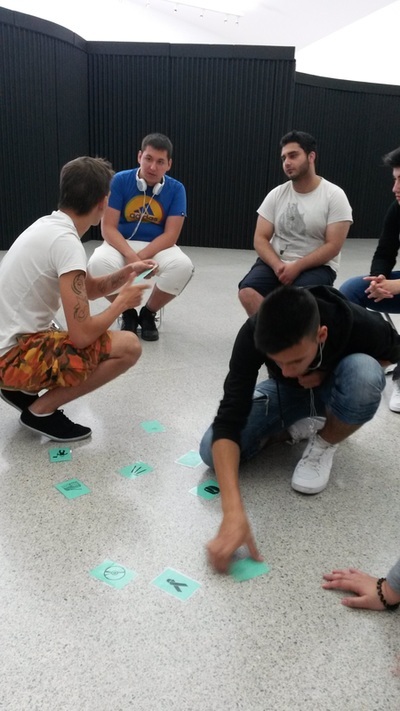 That means that they fanned out in groups and invented word raps dedicated to a certain piece, created gestures that represent the art works or even re-enacted the art works. In this way they interpreted the pieces through our own bodies and presented them to the rest of the group.